I LOVE THIS CARD IT IS SOOOOO ADORABLE! I AM NEW TO THIS BLOG STUFF BUT YOURS IS ONE I CHECK DAILY. YOU HAVE GREAT STUFF. 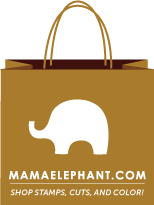 DO YOU HAVE ANY SUGGESTIONS FOR CHIPBOARD COASTERS I JUST PURCHASED A TON? Great card and have a fabulous birthday! Well, Happy Birthday first of all. 36 is nothin.....don't you know that your life begins at 40??! LOL! I love this card! I am going to have to get me some of those Hambo stamps. They are all so adorable. Have a great birthday celebration! What are you talking about lady; you're a spring chicken. I will shoot you an email tommorrow to wish you a Happy Birthday! Oh, and this card. It is just too cute. Great Easter Card! What a cute card. Love the colors, the image & the little extra's make it pop. Thanks for sharing. Have an extra special birthday tomorrow. This is just too cute, Kendra! Another terrific creation...I love the color scheme and those punched elements! Happy birthday babe...I can't believe I am going to be 35 this year (27 in my head though!). you have been very busy--way cute!!!! 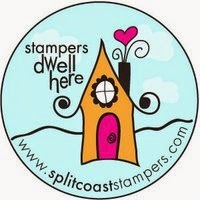 You are gifted-- I can't wait to get thru with make & takes so I can start stampin again!! I am really missing my stamps and my scrapin right now!! Hey!!! Happy Birthday YOUNGSTER!! I'm 48 and feel like a hundred and 48 some days. Other days I feel like I'm four! Have a GREAT Day!!!! Have a drink for me!! Love your cards, Kendra! TFS! Happy Birthday, Kendra!!! Age is all in your head!! And, you could be turning 40 like I am this year, instead of 36!!! Now 36 doesn't sound so bad, does it?? Have a great time with the girls, sure wish I was one of them!! Your card is adorable. Hope you have a great birthday. Beautiful Card!!!! Have a Wonderful Birthday!!! You're 1 yr better!!! 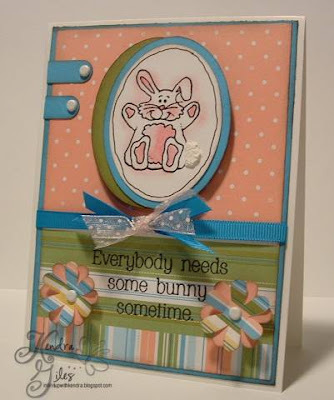 Kendra, this is absolutely the cutest card I have seen yet!!! Omgosh the things you create are soooooooooo amazing!! Happy Birthday! !